Capital of cinema, city of stars and luxury ... Cannes is today known throughout the world thanks to its International Film Festival. The third largest city in the region, after Nice and Antibes, this city offers a wide variety of tourist and cultural activities. The feet in the water, Cannes is also a famous seaside resort where the sun is (almost) always at the rendezvous. But the wealth of the city does not stop there. Its history gives it a special identity. We discover a rich architecture, mysteries also with the iron mask ... Environment: In a small secure residential area of 8 villas, quiet, close to all shops and only 2 km from the sea. 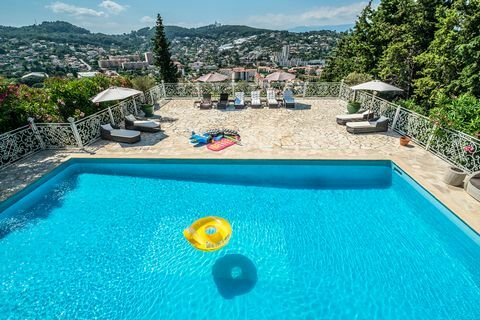 Villa of 100 m² / 6 people 3 rooms Private pool Internet Category: Charming semi-detached villa on one side of 100 sqm, on a plot of 800 sqm fenced, beautiful outdoor areas with open views, beautiful pool with mountain views, in a natural setting, nestled among mimosas. Dining room: 1 mosaic round table and 4 wrought iron chairs, 1 console. Kitchen: independent of 9 m², wooden floor, sink 1 bin, dishwasher, oven, microwave, electric hob, American fridge, filter coffee maker, kettle, pressure cooker, toaster. 3 bedrooms, 1 bathroom, 1 shower in one room, 2 WC: Bedroom 1: on the ground floor of 12 m², parquet floor, 1 double bed 160, bedside tables and lamps, wardrobe, TV, shower and basin in the room, 1 French window garden view. Bedroom 2: upstairs of 11 m², tiled floor, 1 double bed 140, bedside tables and lamps, dresser, wardrobe, desk, TV, 1 window. Bedroom 3: upstairs of 11 m², tiled floor, 1 double bed 140, bedside tables and lamps, wardrobe, wardrobe, TV, 1 window. Bathroom: upstairs 7 m², parquet floor, bath, 2 basins, storage. WC: independent, 1 on the ground floor and 1 upstairs. Accommodation Info: Internet: yes Linen: provided Washing machine and dryer: yes Animals: no Parking spaces: for 2 vehicles inside the property Vis-à-vis: no Nuisance: no Land not occupied by the owner Terrain: 800 m², fenced, planted with mimosas, laurels, cherry trees ... Terrace: 55 m², partly covered by a blind, equipped with a teak table and 6 chairs. Pool: 9 X 4.50 m and 1.30 deep, secured by alarm, equipped with deckchairs, parasol, a garden furniture, with 1 sofa 2 places, 2 armchairs, 1 coffee table, located in front of the Villa. General Info: Sea 2 km Shopping center 1 km Shops at 1 km Doctor at 1 km Downtown 2 km Tennis at 3 km Hospital 5 km Horse riding 6 km Golf at 6 km To pay on the spot: Deposit: 400 euros in cash Final cleaning fee: 200 € in cash Linen (sheets, towels): included Option booking not available Please note: the rates do not include the mandatory hirers' liability insurance. This small amount is a percentage of the rental sum starting from 10 Euros per reservation. Cannes Beach. 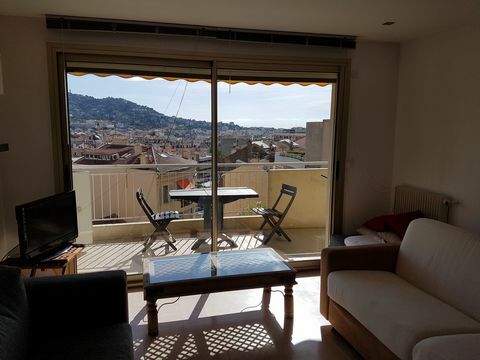 Appart UP Seaview 36 m2. Top Design. Pr. Center. Pool, Private,. 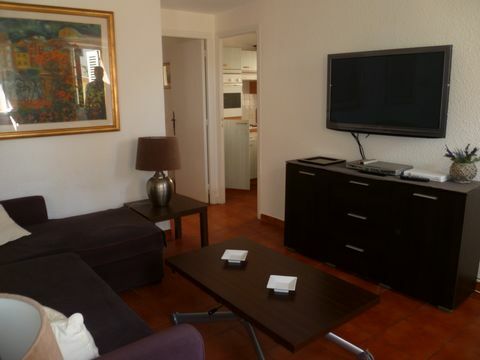 GOLDEN TRIANGLE + PALAIS - 2BR/ 2BA, 67 m2 (AC+WiFi)-. GOLDEN TRIANGLE - OF COURSE !! ATT. Cannes on the Croisette - facing the sea - 3 rooms - wonderful view. Croisette, Cannes, French Riviera, directly on the seafront, near the beach, downtown, internet access, air conditioning A cozy 3-conditioned room for 3 persons available all year for holidays or business trips. Next to hotel Spendid and 2 min walk to Palais, beautiful top floor 3 bedroom apartment with sea view in the living room. It is composed as follows: - living room with sea view and dining room - furnished kitchen open onto the living room - bedroom #1 with double bed, air conditioning - bedroom #2 with small double bed, air conditioning Outside of the apartment but just next to a seperate bedroom and separate shower room with toilet. On the 4th floor without lift. WIFI internet. Résidence Les Félibriges Esc. Terrase 4p. The residence can be found in the historical part of Suquet, 100 meters from the beach on the south, 50 meters from the shops and 1 km from the Palais des Festivals. The completely renovated apartments, you will find them with a studio for two people to an apartment with two rooms for six people, are equipped with air conditioning, a kitchenette with ceramic hob, microwave, grill, dishwasher, bathroom with bath or shower, toilet, television and balcony (the latter at the apartments on the side of the pool). All studios for two people have a view of the city, no balcony. The Residence Les Félibriges in the center of Cannes, 100 meters from the "Midi" beach and a 10-minute walk from the shops and La Croisette and the world-famous Palais des Festivals, houses fully renovated holiday homes ranging from studio apartments for 2 people to 1 bedroom apartments for 6 people. All are air-conditioned and fully equipped with a kitchenette (ceramic hob, microwave / grill, dishwasher), bathroom or shower, separate toilet, free TV and Wifi and a balcony for accommodation overlooking the pool. The residence has a side with a view of the city (without a balcony) and the other with a view of the swimming pool (usually with a balcony). The studio apartments for 2 people and the 1-bedroom apartments for 4 people all look out onto the city without a balcony. At your disposal: Outdoor swimming pool (open from April to October), terrace, laundry (extra cost), parking (paying, limited number of places, limited access, reservations on site). Cannes is world famous for its city with many stars, luster and luxury yachts. Here you will find the legendary Croisette, which plays the leading role at the annual Film Festival. In addition, Cannes is a beautiful seaside resort, with a beautiful bay, protected by the beautiful Lerins islands, golden beaches, green hills of the hinterland, and a beautiful old town and harbor. During a holiday in Cannes you can discover the countless wonders of the Cote d'Azur, along with the coastal towns and villages of the French Riviera. Come and enjoy the sunlight and the spotlights. As a guest you can use the unheated outdoor pool, solarium, laundry for a fee, paid parking. Bed linen and television are available. Access to the internet is free. For an additional fee you can book a final cleaning. A deposit and tourist tax must be paid on arrival. The deposit will be returned to you on the day of departure after the inventory or by post. The accommodations must be left spotlessly clean, if that is not the case, then you will only receive a part of the deposit. Pets are allowed for an additional fee, provided they have a valid vaccination certificate, a tattoo, provided they are kept on a leash in the residence. Please note that any additional services that are payable locally may be changed without prior notice. All information provided is intended to be informative and general. We are not liable if such changes occur unexpectedly. Option booking not available Please note: the rates do not include the mandatory hirers' liability insurance. This small amount is a percentage of the rental sum starting from 10 Euros per reservation. The residence can be found in the historical part of Suquet, 100 meters from the beach on the south, 50 meters from the shops and 1 km from the Palais des Festivals. The completely renovated apartments, you will find them with a studio for two people to an apartment with two rooms for six people, are equipped with air conditioning, a kitchenette with ceramic hob, microwave, grill, dishwasher, bathroom with bath or shower, toilet, television and balcony (the latter at the apartments on the side of the pool). All studios for two people have a view of the city, no balcony. The Residence Les Félibriges in Cannes town centre, 100m from the "Midi" beach and a 10-minute walk to shops and La Croisette and the world-famous Palais des Festivals houses entirely renovated holiday rentals ranging from the studio apartments for 2 people to 1 bedroom apartments for 6 people. All are air-conditioned and fully equipped with a kitchenette (ceramic hob, microwave/grill, dishwasher), bathroom or shower room, separate toilet, free TV and Wifi and a balcony for accommodation overlooking the swimming pool. The Residence has one side facing the town (without balcony) and the other overlooking the swimming pool (generally with balcony). The studio apartments for 2 people and the 1 bedroom apartments for 4 people all overlook the town, without balcony. At your disposal : Outdoor swimming pool (open April to October), terrace, Laundry facilities (extra charge), Car park (extra charge, limited spaces, narrow access, booking on site). 2 rooms 6 people (about 34 m²) Living room with sofa bed 2 persons + pull-out sofa (sleeps 2) Kitchenette equipped with fridge, ceramic hob, microwave / grill, dishwasher Bedroom with 1 double bed Bathroom Separate WC Cannes is world famous for its city with many stars, luster and luxury yachts. Here you will find the legendary Croisette, which plays the leading role at the annual Film Festival. In addition, Cannes is a beautiful seaside resort, with a beautiful bay, protected by the beautiful Lerins islands, golden beaches, green hills of the hinterland, and a beautiful old town and harbor. During a holiday in Cannes you can discover the countless wonders of the Cote d'Azur, along with the coastal towns and villages of the French Riviera. Come and enjoy the sunlight and the spotlights. As a guest you can use the unheated outdoor pool, solarium, laundry for a fee, paid parking. Bed linen and television are available. Access to the internet is free. For an additional fee you can book a final cleaning. A deposit and tourist tax must be paid on arrival. The deposit will be returned to you on the day of departure after the inventory or by post. The accommodations must be left spotlessly clean, if that is not the case, then you will only receive a part of the deposit. Pets are allowed for an additional fee, provided they have a valid vaccination certificate, a tattoo, provided they are kept on a leash in the residence. Please note that any additional services that are payable locally may be changed without prior notice. All information provided is intended to be informative and general. We are not liable if such changes occur unexpectedly. Option booking not available Please note: the rates do not include the mandatory hirers' liability insurance. This small amount is a percentage of the rental sum starting from 10 Euros per reservation. 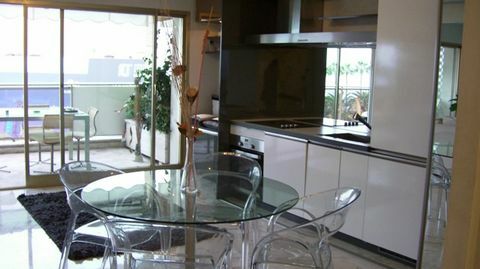 2 bedroom apartment situated in the center of Cannes, within 5min walk to Palais des Festivals. It is composed as follows: - living room with sofa and tv - independent kitchen - bedroom n°1 with two single beds - bathroom with toilet * on the higher floor - bedroom n°2 with double bed - bathroom with toilet 2nd and top floor. No lift. Air conditioning. Wifi. Located in Rhone. Sublet.com Listing ID 2808004. For more information and pictures visit https:// ... /rent.asp and enter listing ID 2808004. Contact Sublet.com at ... if you have questions. Located in Alpes-Maritimes. Sublet.com Listing ID 2553886. For more information and pictures visit https:// ... /rent.asp and enter listing ID 2553886. Contact Sublet.com at ... if you have questions. Located in Alpes-Maritimes. Sublet.com Listing ID 892027. For more information and pictures visit https:// ... /rent.asp and enter listing ID 892027. Contact Sublet.com at ... if you have questions. Prestige appartement across the Palais. Luxury Vacation Villa Rental in Super Cannes. Charming apartment with sea views in Cannes, high lift stick, centrally located. 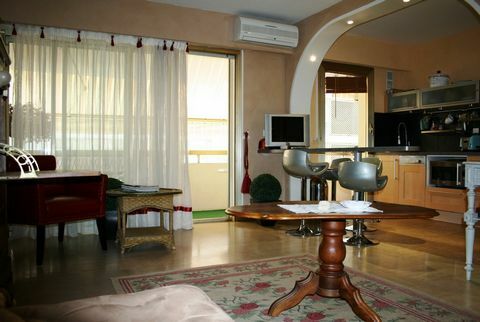 Well-kept and pretty 2-room apartment with sea view (42m2), 5. Floor with lift and balcony for max. 4 pers. 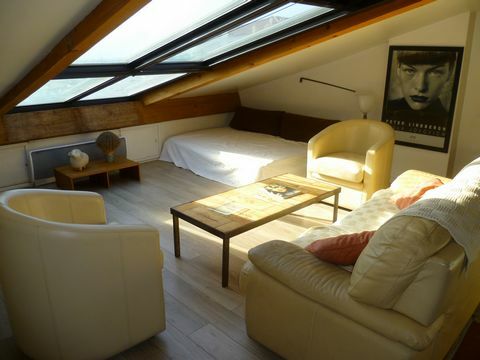 center cannes, neighborhood suquet, atypical fisherman's house, for 2 people.